The biggest changes in the Mazda5 were to the sheet metal. The compact minivan's flowing lines show Mazda's "Nagare" design language. The restyled 2012 Mazda5 gets a bit more power than its predecessor. Wheelbase 108.3 in. 108.3 in. Length 180.5 in. 181.5 in. Width 68.9 in. 69.0 in. Height 63.6 in. 64.2 in. Curb weight 3,417 lbs. 3,422 lbs. SAN DIEGO -- Compact minivans such as the Mazda5 do well in overseas markets, but they've never had much impact in the United States. Still, the restyled 2012 Mazda5 is a relatively low-risk investment for Mazda. The vehicle is sold globally, shares a platform with the Mazda3 and CX-7 and takes many components from the previous-generation Mazda5, which debuted in 2005. 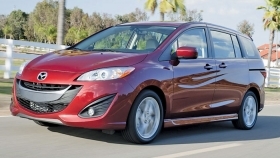 The basics: The 2012 Mazda5 has a new powertrain and looks different inside and out. The restyled compact minivan carries the same 157-hp, 2.5-liter four-cylinder engine used in the Mazda3. The powerplant gains 4 hp and 15 pounds-feet of torque over the 2.3-liter engine used in the 2010 model. (Mazda skipped the 2011 model year for the Mazda5). A new six-speed manual transmission replaces the five-speed used on the base 2010 version. Other than that, the Mazda5's exterior dimensions, weight and fuel economy are close to that of the outgoing 2010 model. Notable features: The biggest changes were made to the sheet metal. The flowing lines stamped into the Mazda5's beltline mark the first production vehicle that uses Mazda's "Nagare" design language. But the Mazda5 will also be the last vehicle heavily influenced by Nagare. The company's new "Kodo" design language, seen on the Shinari concept car revealed at the Los Angeles Auto Show in November, represents Mazda's design future. "Kodo" is Japanese for "soul of motion." The market: Mazda expects to sell 15,000 units of the Mazda5 in 2011, compared with 15,683 in 2010 and its peak of 22,021 units in 2008. What Mazda says: Robert Davis, Mazda's head of product planning in North America, says that with rising gasoline prices and more compact minivans on the way -- such as Ford's C-Max -- the segment could hit 100,000 annual units within three years. The C-Max arrives early next year. The segment now consists only of the Mazda5 and the Kia Rondo, which is being phased out. "We're excited about C-Max," Davis said. "You might say, 'you're crazy,' but think about it. When you put the 800-pound gorilla in a segment like this, they deliver a bunch of awareness and a bunch of marketing resources to the segment. A rising tide is going to lift all ships." The skinny: The jury is still out on whether the compact minivan segment will catch on in this country. If it does, the driving dynamics, styling and utility of the Mazda5 might catch on, too.